Thank you very much again for all you highly thought provoking posts. Also the observation at the end on the effects of ketogenics diets in a dog may be of interest. Hi Robert, I'll try and listen to the youtube clip later. Seyfried is a clinician and occasionally comes up with odd ideas, I remember him describing glycolysis as "primitive". No, ox-phos is primitive, glycolysis is very complex by comparison... I found LC diets helped dogs perfectly well but ketosis is hard to achieve and I've not had much experience of ketogenic diets in dogs. I think Elaine Cantin may have more experience. My experience with Hill's N/D crapinacan anti caner diet is that it is as effective as chemo for lymphoma but very poorly tolerated, lots of diarrhoea problems. Omega 3 based. But that was back in the days when I had my own practice rather than working in a corporate place or being primary child care (now). I re-read Masterjohn's 2012 post which has me thoroughly confused given his latest podcast/video on the matter. I asked him "why" on Twitter. Curious to see his answer. I think Seyfried referred to substrate-level phosphorylation occurring in mitochondria (aka pseudo-respiration) as primitive, not glycolysis per se. Maybe i misunderstood him. This reminds of https://www.ncbi.nlm.nih.gov/pubmed/25043755 "Targeting cancer's weaknesses (not its strengths): Therapeutic strategies suggested by the atavistic model" by Lineweaver, Davies & Vincent. I like how they link evolutionary theory the the Metabolic Theory. However the point you raise about glycolysis being more complex than fatty acid oxidation, and thus probably arising later, may introduce a spanner into the works. raphi, I can't recall exactly which clip I picked up the glycolysis (or not!) comment in so it's hard to check. But re FFAs, it's ox phos I view as primitive. What is used for the ox phos depends on what's available and FFAs may be quite recent compared to CO2/H2/formate or even pyruvate and the rest... BTW Fermentation of amino acids is clearly very interesting! Re acetone/oxaloacetate: This is really weird. What goes on within the mind to produce such ability? There doesn't seem to be any cognitive dissonance, just selective citation. But why? What benefit to anyone comes from presenting this incorrect information? Where does the need to accept that ketones per se might be beneficial but a fatty acid based metabolism must be avoided? This is what puzzles me, and fascinates me too. It's like watching some degenerative process..... But what drives it? There must be a reason but damned if I can understand it. 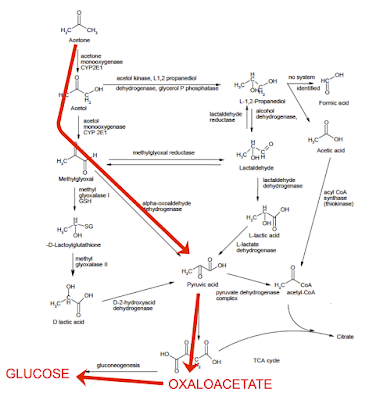 Something interesting I have only just noticed in your diagram is that both l-lactic and d-lactic acid seem to be normal metabolites. 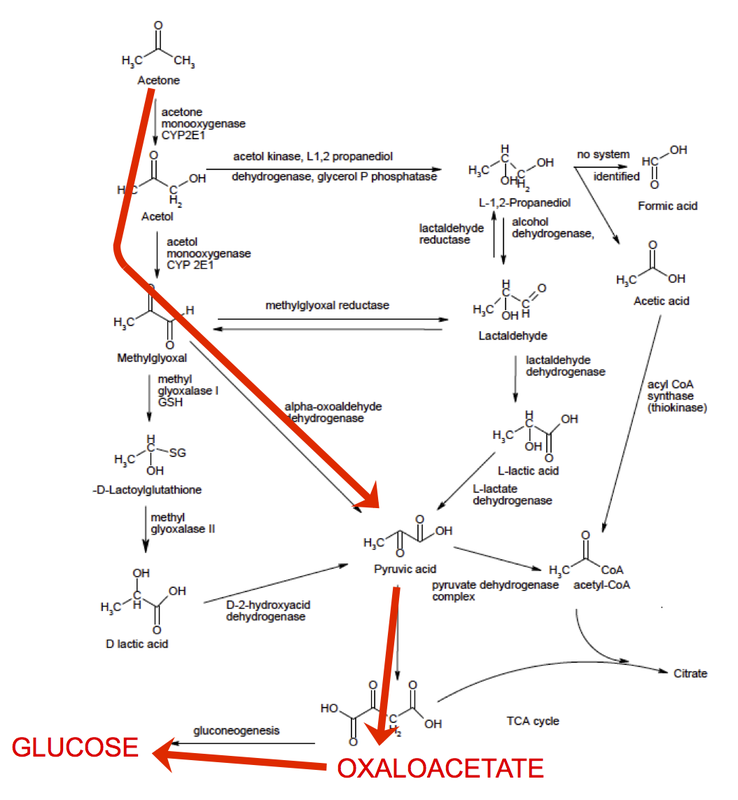 I wonder what regulates the three different pathways there from acetone to pyruvate? PS, I suppose in the best of all possible worlds the notion of a hfhc regime with zero protein had to crop up eventually but it does remind me of the p-word and butter diet. Ah right, OxPhos and not just beta-oxidation. 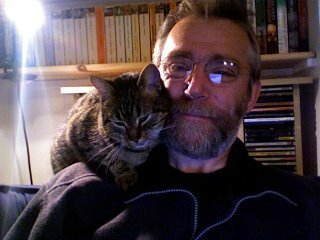 I'm 1/4 through Nick Lane's excellent last book which I need to finish, but am being slowed down by work on my cancer thesis. Occam's Razor might suggest Masterjohn is poo-pooing the 4-11% contribution of acetone to glucose...however that still isn't right. There are many open questions, sure, but I'm spotting a trend. Yes, pooh poohing it is one thing. Laying down the law that it doesn't (or can't) happen is quite another. One is opinion (as things stand), the other is, well......... "Incorrect" is the kindest thing I can say. A case of PhD-itis ? Like Stephan Guyenet, who also changed tune after graduation ? Could be that audio and video clips are a really bad way of discoursing this information? Why not write stuff down and link the citations? My first take was to not watch it - but I had been intrigued by other things that Masterjohn had to say - and today I can play the youtubes at 2x so I don't become comatose. ( I once tried to listen to Ray Peat - who had written many interesting (yet often dense and disjointed) things and even at 2X it hurt). Anyway this confused me to the point that I needed someone else perspective. Part of what happens is the narrative - it is seldom clear what is speculation and what is well known. We all want the story - yet the desire for the story that ties things together can be misleading. As I've waded into this stuff what I see is incredibly complex - full of nested and undecipherable control loops. A lot of this is like nailing Jello to the wall.. Biologists are supposed to know that we evolved - yet assume that the systems are engineered like a car and not by genetic algorithms. Reverse engineering electronics is really hard (try disassembling some binary software to see if it is compromised..). Yet - biology is not even a product of human engineering.. it is not designed, but instead evolved.. It often doesn't make sense - but is only so because it works..
Obviously not designed by man - and I think biology is similar - lots of non intuitive bits that require a perspective of evolutionary history to take in. Narratives often lead us astray. There is an unusually bright friend of mine, that points out any analogy - his take is they are always misleading/political. Narratives are full of them..
Analogies lead to group identification/racism etc.. all part of lazy thinking. Anyway, I once again am committing myself to ignore any videos - part of fine-tuning my BS filter is to insist that material is written down..
re: Anyway, I once again am committing myself to ignore any videos - part of fine-tuning my BS filter is to insist that material is written down.. In our looming dystopian future, GoogleAppleSoft will automatically generate transcripts for all open-access videos, with hot-spotted regenerations of screenshoted slides and presumed cites. They will be incorrect, of course, and the auto-translations will be even less reliable. Many will result in DMCA takedowns. More than a few will result in lawsuits. A handful will lead to international incidents. The advancement of human knowledge will not be served. Karl, it's not just that narrative is full of analogy, language is the original leaky screwdriver to borrow your example, and a screwdriver often resembles a hammer. Boundless, I remember a pastime from some science fiction book in pre-internet times in which the goal was to translate an idiom from English back into English via several intervening languages. The examples were puzzling and hilarious. It has now come to pass. Endless diagrams of the tca as a big circle might be masking some other realities by guiding our thoughts along predestined tracks. Isn't it the case that the various substrates and enzymes are mostly floating around loose, interacting with others that are fixed to mt membranes or being transported in and out, so there are some pretty strange reaction kinetics driven by a combination of concentration gradients and electric gradients and everything else? ie what Karl said. Fasting, or low insulin in the case of the diabetic rats, seems to upregulate alpha-oxidation of SFAs. 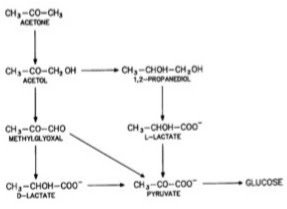 This is said to be a gluconeogenic pathway (propionate-> succinate -> oxaloacetate probably), and it also produces margaric acid and similar oddball SFAs. Thus margaric acid can be among other things a fasting marker, and there's another pathway for fatty acid oxidation to supply glucose. Although the rate of alpha-oxidation was very low compared to that of beta-oxidation, these results suggested that alpha-oxidation of fatty acids was induced under fasting or diabetic conditions, and that alpha-oxidation might take place at the butyric acid stage. I was sort of expecting this - now he says it is the amount. No citation. Still we might want to point out if there is no paper to support the narrative. If the amount is rate limiting - sort of needs a paper to base it on - I looked earlier and couldn't find one. Could be out there? The amount gives an RQ of 0.62 in Volek's study. No doubt those folks were losing muscle despite their protein intake, but an RQ of 0.62 is very impressively low. I doubt he wants to understand this. Ultimately, Masterjohn is degraded in terms of any credibility. Unfortunate for those who follow him, but there you go. They can just get on with it. So, instead of carbs to maintain acetone/oxaloacetate we could just chug nail polish remover. Hee hee, I'd rather go with the RQ of 0.62 and leave the nail polish remover for people who think metabolism is stupid! Ah, that's where I'm wrong. Good job he's there to set all to rights! Thank you Peter for this post and your comments. January, 2017, I am just reading this post now. It's a sad day to see Chris Masterjohn derail. I have been reading at several keto facebook groups, (I know that is a silly waste of time), but it seems as if there is a very strong force to derail ketosis, too. They are denying the need to keep protein fairly limited, quoting quotes and calling it science. "all fats can go to adipose tissue and their accumulation there is dependent on whether you are in caloric excess" C. Masterjohn. You accumulate fat when you accumulate fat. Just awesome.